The training seminar aims to strengthen the ability of the participants to respond to the needs of today’s teen-agers with respect to issues on human sexuality, marriage, family planning and population education, according to the teachings of the Catholic Church. It is designed for teachers, counselors, catechists, parents, lay leaders, and others who deal with teen-agers on issues mentioned above. 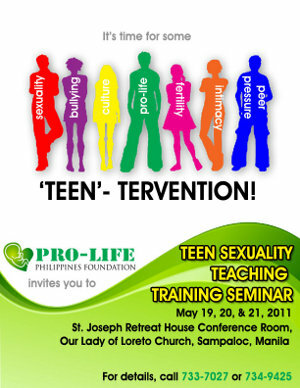 Participants will be trained to implement the training modules on teen sexuality packaged in our manual entitled “LEARNING TO LIVE and LOVE” Plus updated supplementary activity and reading materials. This manual has been endorsed by the Episcopal Commission on Catechesis and Catholic Education and the Commission on Family and Life of the Archdiocese of Manila.